Mobilegeddon is the nickname give to Google's latest mobile-friendly search algorithm that promised to uproot rankings for websites that weren't mobile-friendly. But in reality, it’s not quite as potent. We recently discussed the effects of this algorithm thus far on websites, and they have not been catastrophic as Google has threatened. However, a lot of websites did get hit. Let's talk about how to take the first steps towards recovering from this penalty. 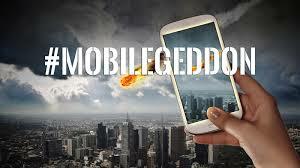 Mobilegeddon is the next big thing in Google algorithm updates. Unlike Panda, Penguin, Pigeon, Hummingbird and the other algorithms, you might have noticed it’s not an animal name. This is because the people who name things aren't really consistent or original. Don’t worry about it. This particular update, as the moniker implies, deals heavily with mobile SEO. Specifically, it makes “being mobile-friendly” a ranking factor. If your site is mobile friendly, congratulations; you’re perfectly safe. If your site isn't mobile-friendly, you’ll be hit by the penalty, which might be pretty bad depending on how far from mobile friendly you are. Google has a list of mobile guidelines, but they can all be summarized fairly easily. Use text that’s properly sized for small devices. If the user has to zoom in just to read your site, it’s not going to be very useful to them, and they’ll find another resource. The same goes for other content. Make sure everything fits on the screen. If the user has to scroll horizontally, you’re going to earn a penalty. Make sure your links and navigation are spaced out and easy to use. The user should never be able to “fat finger” the wrong link because two are too close together. If you want to test to see if your site is mobile friendly, you can use Google’s testing tool. Step 1: Figure out how bad the hit to your traffic was. The Mobilegeddon update rolls out over the course of a week, so choose a 2-week period both before and after the date to get an idea of your traffic. Use whatever analytics program you want, though Google Analytics is probably the best for diagnosing a Google penalty. If your traffic wasn’t actually hit all that hard, you can get away with taking your time on a mobile update. Of course, you’ve had plenty of time already. Step 2: Determine the scale of the changes you need to make. This is a pretty complex step, and step three will depend on what you determine here. Step 3: Implement whatever level of fix you need to. This might mean tweaking your existing site, or it might mean implementing an entirely new responsive redesign. How quickly you need it, and how harshly it hurts you to not have it, depends on how badly you were hit. If you’re using WordPress, WP Touch Pro is an easy solution. At the smallest level, use tools like Google’s pagespeed ranking to see if your site is fine, but just a little slow. Sometimes you’ll see a drop in traffic because your mobile site is a little slow, but there’s nothing technically wrong with it. Just work to speed up your side by making code a little more streamlined, maybe cutting a bit of the heavier multimedia content, that sort of thing. A step up the chain, maybe you have a mobile site but it breaks several of Google’s best practices. Maybe you have too many links and they’re too close together. If your links are hard to tap accurately, you’ll be penalized. Remove or space out your links. The same goes for too-small fonts or multimedia content that doesn’t load. You can’t force iPhone users to view a Flash site, and Google will penalize you for it. At almost the top level, you have the lack of a mobile site at all. Maybe users can use your desktop site via a phone through liberal use of zoom and magnification tools, but at least it functions. You’ll be penalized pretty hard for this, but the most necessary visitors can still use your site. Take the time to develop a responsive redesign, and hurry to implement it, but make sure it works before you throw up some hastily and shoddily coded substitute.